Oh so creamy! 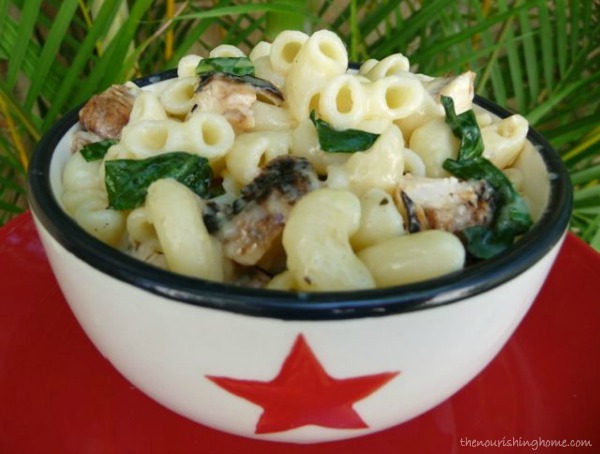 This easy-to-make mac-n-cheese will bring smiles to your kiddos faces, and yours too! This month as part of my Kids in the Kitchen Summer School Series, I’ve been jazzed about sharing some quick and healthy whole food recipes perfect for cooking with kids! 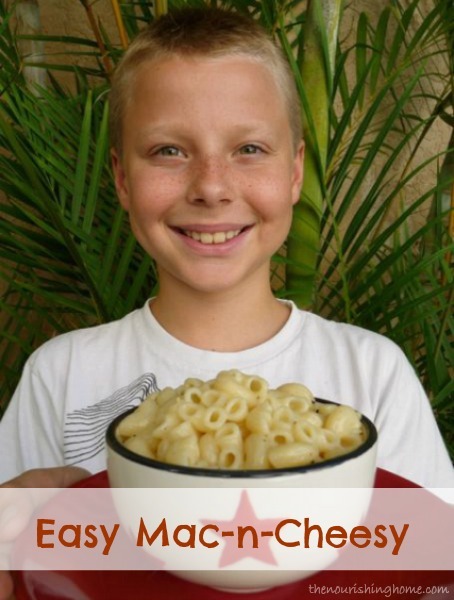 And this Easy Mac-n-Cheesy is no exception! So simple and delicious, there is no need to open a box, when you can make it yourself in virtually the same amount of time using nutritious real food ingredients! Reader Recommendation! Nourishing Home subscriber Sharon recommends tossing in your favorite protein-rich add-ins such as diced grilled chicken, ham, ground beef, bacon or chorizo. And, why not add some healthy veggies too, such as broccoli, chard, kale, collards or spinach. Brilliant! Cook pasta according to instructions. While pasta is cooking, grate cheese and measure out the cream and milk. Collect remaining ingredients to have ready. Once pasta is al dente, make sure to reserve about 1/2 cup of the pasta water. Then drain the cooked pasta and rinse thoroughly with cool water. Set aside. Using the same saucepan, over medium heat, melt the butter and add the cream, milk and cheese. Stir constantly until smooth and creamy. Then mix in the dry mustard, salt and pepper. Add the pasta to the cheese sauce and stir well to combine. To thin out the sauce, add one tablespoon at a time of the reserved pasta cooking water while stirring, until desired consistency is achieved. If adding extras like cooked diced meats or veggies, simply stir them in and enjoy! Make it a healthy meal by mixing in your favorite diced meats and some wholesome greens and veggies too! See photo above for some nutritious and delicious add-in ideas! This is a really delicious and simple recipe, thanks so much! I made this for dinner tonight and it was a hit! I made it a meal by adding some cooked chicken and broccoli. Delicious, and the kids ate it up. Thanks! Hi Kelly! Thanks again for the wonderful resource you have provided for us! Trader Joes does sell raw milk and grassfed cheddar for a reasonable price, at least here in Southern California. So be sure to ask the dairy case person there to help you locate it. As far as raw milk itself goes, that’s a toughie. And I can completely understand your struggle with the cost. Here’s the decision we made as a family … we stopped drinking dairy milk and switched to almond milk for use in our granola and most cooking needs. We did this to reduce our food budget, as we could not afford raw milk either, and actually we prefer unsweetened almond milk. When I do need dairy milk for cooking, such as in this dish, I try to use raw milk dairy when I can find it at a reasonable price, but honestly, most of the time I purchase pasteurized only (not ultra-pasteurized) cream and milk, and I don’t worry about it since we only use milk occasionally. But I definitely would not recommend consuming large amounts of pasteurized milk, i.e. drinking glasses of it daily. I personally believe after doing the research that it is not a healthy choice to be consuming large amounts of pasteurized dairy and for some (those with dairy issues) obviously dairy in general is an issue. Blessings to you, sweet sister! I agree with you a 100% about the pasteurized milk issue. I was giving my 2 yr old almond milk exclusively until she started having some serious tooth decay issues. We brushed and flossed every day and she hardly ever had sugary sweets yet her teeth were suffering. That is when I started doing homework on diet and discovered Dr. Price. We switched to raw milk immediately. Funny thing is, I haven’t been able to drink milk in years because of the stomach pains it would give me but I can pound the raw stuff! I am in southern California as well but our Trader Joe’s doesn’t sell raw milk for some reason. I can find it at Sprouts and wow is it expensive but very necessary in our situation considering my daughter’s teeth. I found pastured eggs at the local farmer’s market but it looks like our best option for pastured meat is to buy in bulk from a farm. We are going to buy a deep freezer and purchase quarter and half pigs and cows. I can’t believe how hard it is to find healthy animals who are raised the way nature intended! It blows my mind. Anyhow, we are now regular consumers of bone broth, raw milk, and fermented cod liver oil. We have removed all grains for the time being and will resume with soaking once her teeth have healed. We have already seen a huge difference in just a few months. Thank you so much for sharing your recipes and tips. I made your Easy Mac-n-Cheesy today and it was, in fact, easy and tasty! I have made many of your recipes and none of them have disappointed. Before finding your website, I hated cooking. I would get anxiety by the thought of it. You have changed that for me. While cooking is still a chore, I am not stressed out about it and my family loves the food. You have truly been a blessing to me and my family. Thank you! Thank you! Thank you!